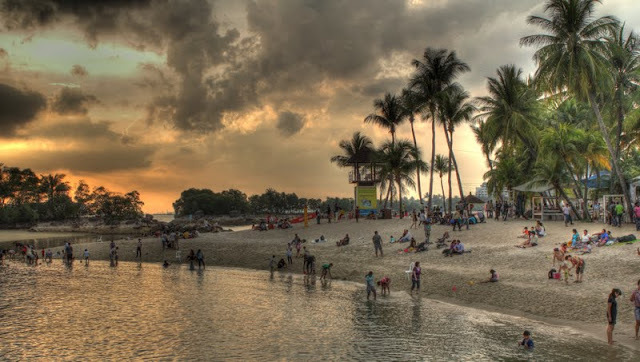 VivoCity is the gateway to Sentosa Island, where you can enjoy the universal studios or watch Song of the Sea or go to Fort Siloso or play at beach and various attractions there. From VivoCity you can take the Sentosa Express monorail which is on level 3, next to the Food Republic food court. (known as Sentosa Station). 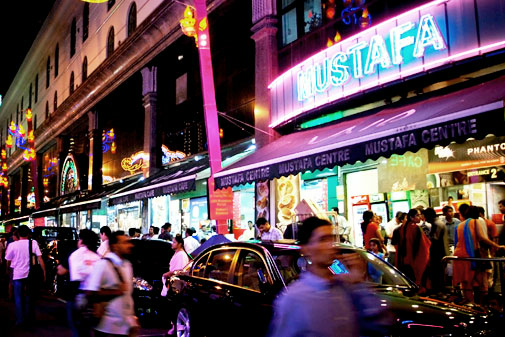 Mustafa Centre is one of Singaporean's 24-hour shopping malls which is located on Syed Alwi Road in Little India. Located at a walking distance from Farrer Park on the North East Line, Mustafa Centre is a retail hub which caters mainly to the budget market. The department store at Mustafa Centre consists of two shopping centres: one retailing jewellery and household appliances, and has a supermarket in it; and the other selling books, CDs and DVDs, watches, electronic goods, footwear and clothing. The business concept of offering other services such as Foreign Exchange, VISA Processing, Travels Booking, Gold Mart, GST refund counter and all kinds of shopping item available under one roof. The place is huge and you need a couple of hours to cover all the departments, It is not the most sophisticated and classy place to shop in Singapore but it surely sells almost everything at a reasonable price and also open 24hours, thus making Mustafa a popular shopping place for tourists. You can get almost anything from over 300,000 items displayed on four levels covering an area of 400,000 Sq.ft within the six story building along Syed Alwi Road. It has a wide variety of goods from souvenirs, food, spice to electronics. Just selecting carefully and patiently cause sometimes if you're lucky you will find the same things with lower price or better quality, like t shirt (Singapore-is-a-fine-country T-shirt), souvenir, etc. But remember, most of those items can be purchased from other places in Singapore, like Chinatown or Bugis Street market, even at Orchard Road with better quality and price. If you have limited time for shopping around but wanted to buy some souvenirs before leaving for airport, Mustafa might be your best choice. You can go there even after midnight, do your shopping and if you do not have enough space in your luggage, you can always buy extra luggage in Mustafa too, but make sure you refund your GST if you can. There are lots of Indian restaurant around Mustafa so don’t worry about getting hungry. Take MRT of the North East Line (purple) - Punggol to Harbour Front and alight at Farrer Park station, do not alight at Little India station. Services operate from about 5:30 am and usually end before 1 a.m. daily with intervals of approximately three to eight minutes. For after midnight shopping, use the taxi services. If you don’t mind the crowds, come by on a Saturday or Sunday evening, but if you want to do your shopping leisurely then go after midnight. Before you buy the perishable products, please check the packaging and the expiry date. Don’t rush, takes your time to look through every shelf through out the mall, some items might not be displayed at the same area, be sure to browse first unless you already know what you want to buy. Ask your shopping bags to be locked with cable ties before entering the store. Sometimes the security guards may request for your personal bag (non-handbags) to be cable-tied as well. There's a storage counter if you are carrying big bags. It's better to put it at their temporary storage because the passage ways are narrow, you won't want to knock things down. Orchard Road is flanked by pedestrian malls where you can find numerous up level shops, restaurants, coffee chains, cafés, nightclubs and hotels. 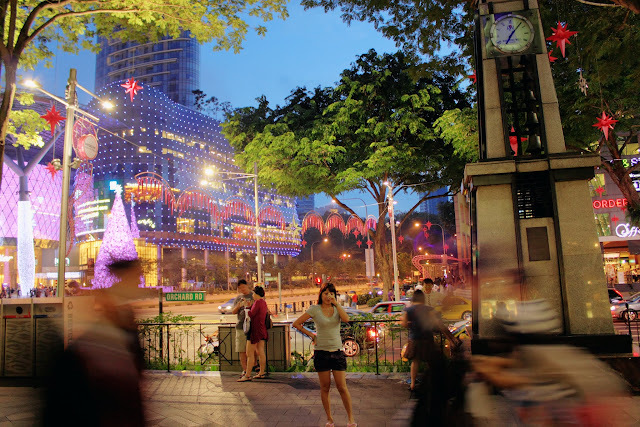 Most of the big international brands are located on the best stretch of Orchard Road. There are excellent restaurants to be found as well. All of these are in one walking distance from each other. A real shoppers' paradise mall for a shop till you drop . 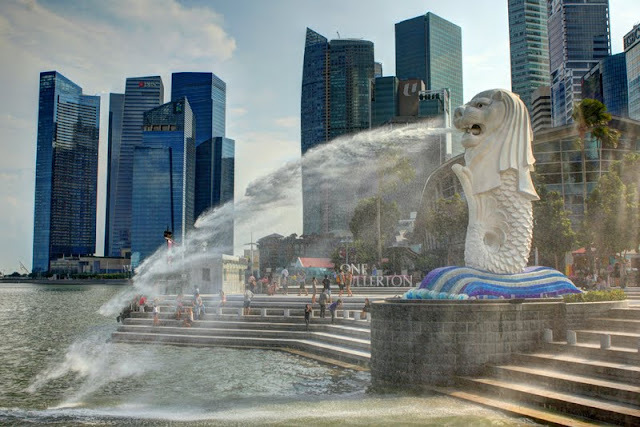 It is a must see to all visitors who come to Singapore. It is always busy, always full of people, always full of live.This place is well maintained of cleanness, lights are on everywhere, makes a nice scenery at night. Especially during Christmas time, the street would be decorated with colorful lightings so you can feel the festive atmosphere. When all the lights were up in the night, it was a quite amazing sight, worth to take a picture or two to be sent home. The street is neat and it is quite fun just to walk aimlessly around or you can sit back at one of the cafes along the street with an Earl Grey tea or a nice iced coffee. You can also enjoy an ice cream with crackers with only 1 dollar at there. 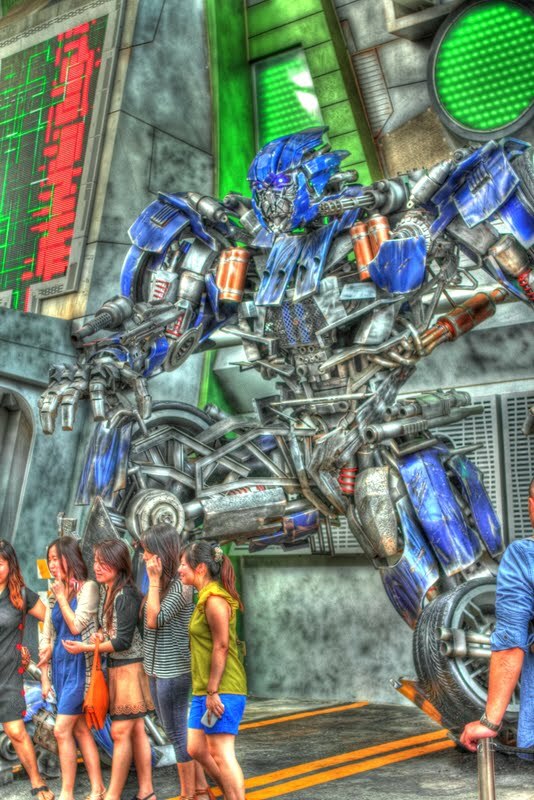 Orchard Road is a 2.2 kilometer-long street that is the retail and entertainment hub of Singapore. 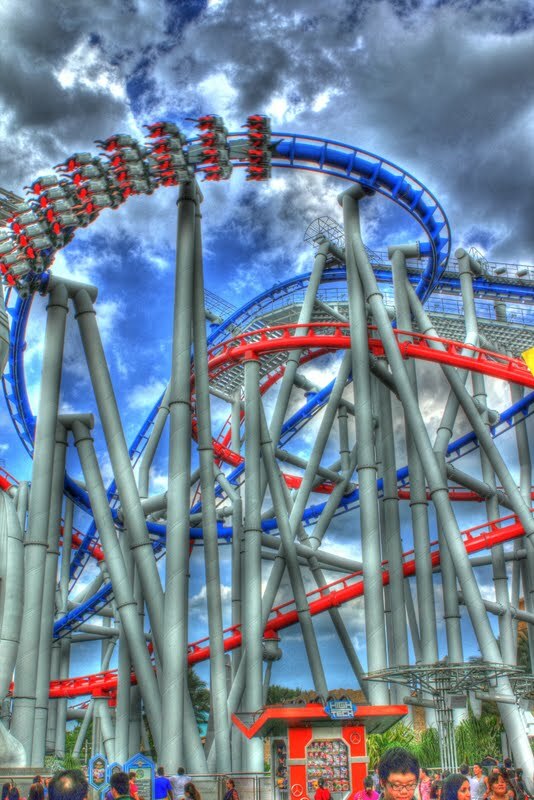 It is a major tourist attraction, in addition to being the most popular shopping enclave in the city-state. Often, the surrounding area is known simply as Orchard, simply because the MRT station that serves the vicinity is named Orchard. The street starts at the junction with Orange Grove Road which is the location of the Orchard Hotel. It then stretches southeast across the Scotts Road/Paterson Hill junction, Orchard MRT Station, Bideford Road, Somerset MRT Station, Central Expressway, Dhoby Ghaut MRT Station, and ends at the junction with Handy Road (just before Prinsep Street), where it becomes Bras Basah Road. It has an extensive underground infrastructure, including underground pedestrian walkways between the malls running underneath the street and other streets in the vicinity. The numbers begin at Handy Road and end at Orange Grove Road. Orchard Road got its name from the nutmeg, pepper and fruit orchards or the plantations that the road led to in the mid-1800s. Commercial development began in the twentieth century and took off in the 1970s. History said that at 1840s, graveyards began to appear along this road. By 1846, the Chinese had a large graveyard around what is now the Meritus Mandarin Hotel and Ngee Ann City, while the Sumatrans from Bencoolen had their burial ground where the current Grand Central Hotel stands. Later a Jewish cemetery was established; it was located where Dhoby Ghaut MRT Station is now and was demolished in 1984. DFS Galleria — This duty-free shopping mall is on Scotts Road, and mainly sells luxury item such as Bottega Veneta, Louis Vuitton, Prada, Gucci, Hermès, Loewe and Bvlgari. ION Orchard —houses six double-storey flagship stores of close to 9,000 square feet (840 m2) each, including Prada, Giorgio Armani, Louis Vuitton, Dior, Dolce & Gabbana, Cartier and Patek Philippe. 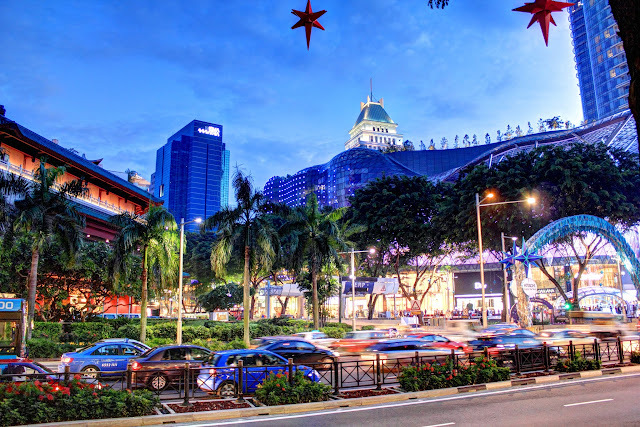 Ngee Ann City —the largest shopping mall in the Orchard Road shopping belt. It houses branded boutiques such as Vacheron Constantin, Louis Vuitton, Hermès, Burberry, Loewe and Chanel as well as Japanese department store, Takashimaya, Books Kinokuniya. Wisma Atria — There is a 900 seat food court on the 4th floor which is run by the BreadTalk Group. The mall is directly connected to Orchard station..
Plaza Singapura — Located next to the Istana, currently houses a Golden Village cineplex, Carrefour and other shops. Lucky Plaza — A shopping mall that somehow became the main focal point for domestic Filipino workers to meet their friends during their off days. The place is known to be very crowded on Sundays with many shops selling products from the Philippines. Far East Plaza — Popular with students due to its cheap fashion items as well as inexpensive food, the plaza is also known for its cheap food outlets. Mandarin Gallery — Located inside Meritus Mandarin Singapore housing international high-end brands like Y-3, Bape and Hugo Boss. Orchard Towers — a mall consisting of twin blocks with small shops and night clubs as well as a reputation for promiscuous activity after-hours. 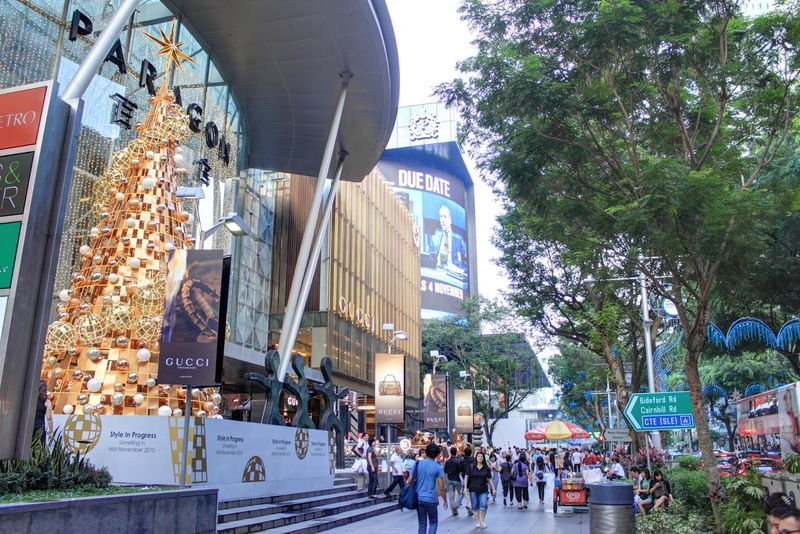 The Paragon — a high-end shopping mall selling branded items such as Gucci (whose flagship store operates here), as well as Miu Miu, Prada, Coach, and Burberry with a Metro department store and a Marks & Spencer store as well. The place has a Toys 'R' Us and a number of restaurants. 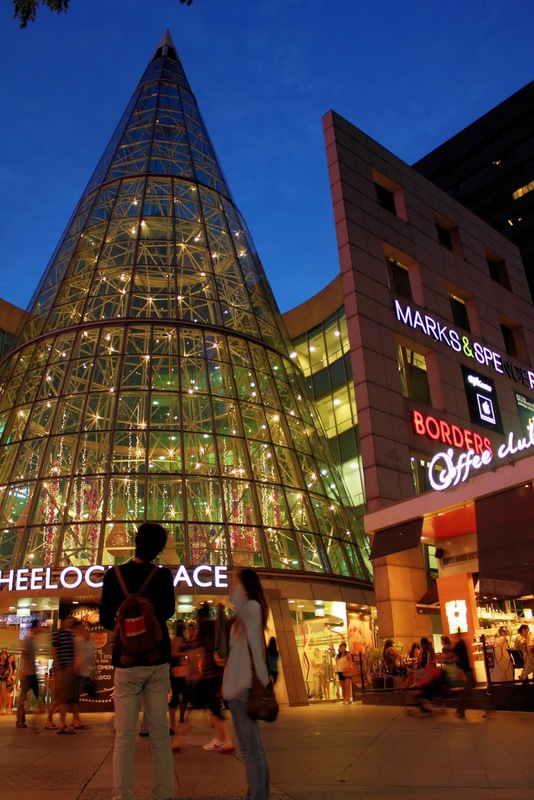 The Centrepoint — The mall has Robinsons and Marks and Spencer as its anchor tenants. The Heeren Shops — This mall targets young, working age shoppers. It is currently home to one of two T.G.I. Friday's on the island. Forum The Shopping Mall — it sells mainly branded children's clothes and accessories with a Toys "R" Us on the third floor. It also has a number of branded boutiques such as Emporio Armani and Dolce and Gabbana. Shaw House and Centre — Shaw House is home to the Isetan department store, and on the fifth and sixth floors the one of the largest cinema halls in Singapore, Lido 8 Cineplex, resides. This mall is also home to a number of shops such as Fendi, Loewe and Celine. Tang Plaza — where the homegrown department store, Tangs, is located. Hilton Singapore — Located inside the hotel itself, the Hilton Shopping Gallery houses branded boutiques such as Louis Vuitton, Cartier, Bulgari, Lanvin, Donna Karan, Balenciaga and Dolce & Gabbana. It also includes Club21, a high-end Singapore based company that sell luxury items such as Mulberry, Comme des Garçons and Dries van Noten. Palais Renaissance — houses upmarket branded boutiques such brand like Donna Karen and Valentino. Liat Towers — International names such as Audemars Piguet, Massimo Dutti, Hermès and Zara are housed in the building. 313@Somerset — somerset is directly linked to the Somerset MRT station and features a concentration of mid-range retail and dining outlets. Retail options are made of a mix of local and global fashion labels including Zara, Uniqlo, New Look, Esprit and a Forever 21 flagship store that spans four floors. There are also a food court, "Food Republic" situated on the 5th Floor. There are three major MRT stations in the Orchard Road vicinity: Orchard, Somerset and Dhoby Ghaut. These stations are important hubs for commuters, locals, students and tourists who travel to the Orchard Road shopping and business district. Since the opening of the ION Orchard, the entrance of the Orchard entrance has been moved underground below the upcoming mall. 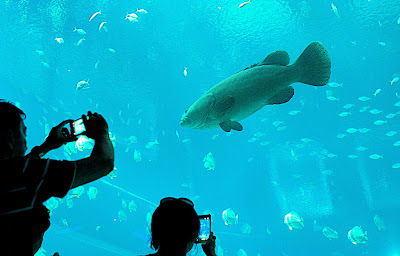 Singapore Zoo, from the beginning, followed the modern trend of displaying animals in naturalistic, 'open' exhibits with hidden barriers, moats, and glass between the animals and visitors. Animals are kept in spacious, landscaped enclosures separated from the visitors by either dry or wet moats. The moats are concealed with vegetation or dropped below the line of vision. Dangerous animals that can climb well are housed in landscaped glass-fronted enclosures. 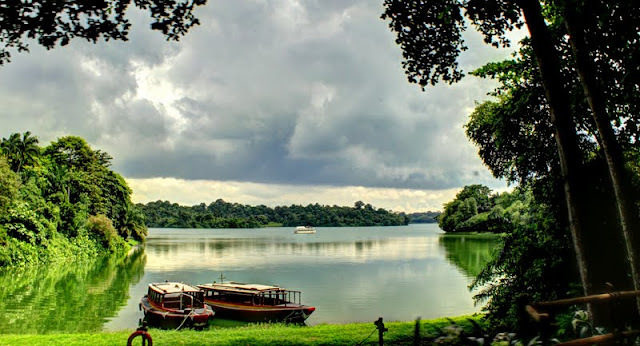 The Singapore Zoo (Chinese: 新加坡动物园; pinyin: Xīnjiāpō Dòngwùyuán; Malay: 'Taman Haiwan Singapura'; Tamil: சிங்கப்பூர் விலங்குக் காட்சிச்சாலை), formerly known as the Singapore Zoological Gardens and commonly known locally as the Mandai Zoo, occupies 28 hectares (69 acres) on the margins of Upper Seletar Reservoir within Singapore's heavily forested central catchment area. 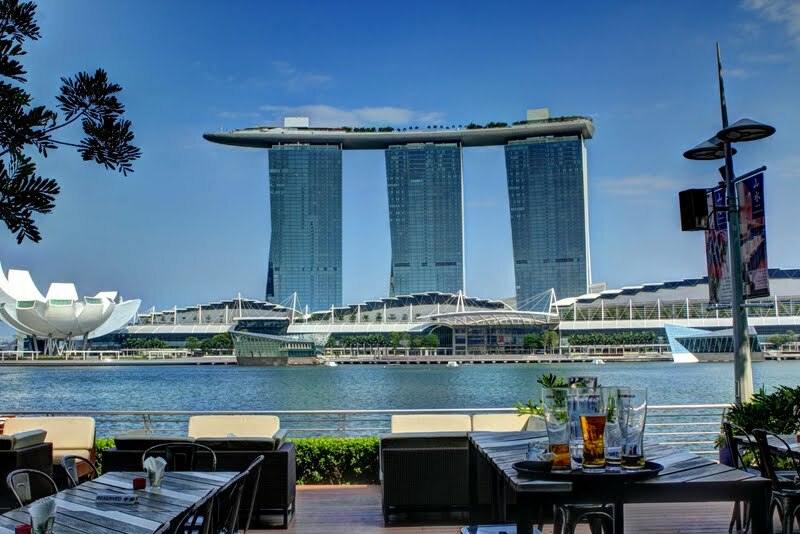 Marina Bay Sands features three 55-story hotel towers. The three towers are connected by a 1 hectare sky terrace on the roof, named Sands SkyPark. In front of the three towers include a Theatre Block, a Convention and Exhibition Facilities Block, as well as the Casino Block, which have up to 1000 gaming tables and 1400 slot machines. The ArtScience Museum is constructed next to the three blocks and has the shape of a lotus. 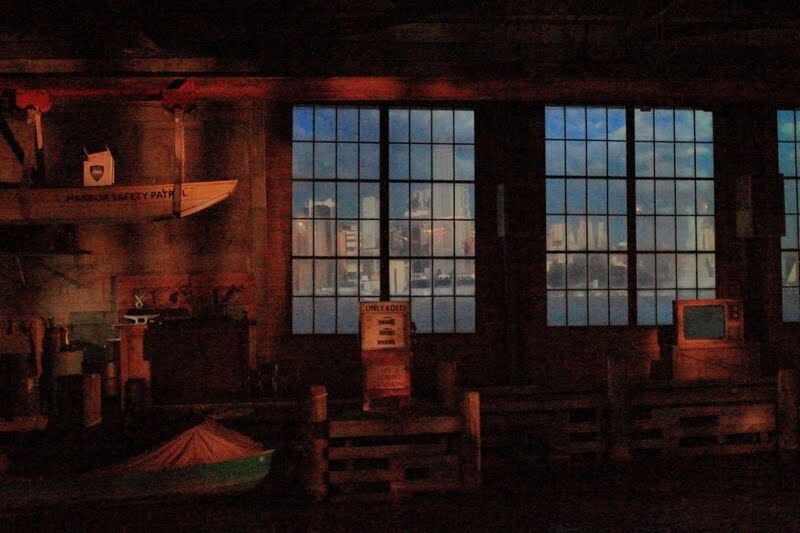 Its roof will be retractable, providing a waterfall through the roof of collected rainwater when closed in the day and with laser shows when opened at night. In front of the Event Plaza is the Wonder Full show, a light and water spectacular that is the largest in Southeast Asia. The SkyPark is home to the world's longest elevated swimming pool, with a 146-metre (478 ft) vanishing edge, perched 191 metres above the ground. The pools are made up of 422,000 pounds of stainless steel and can hold 376,500 gallons (1424 cubic metres) of water. The SkyPark also boasts rooftop restaurants such as The Sky on 57 (by Justin Quek), nightclubs such as KU DÉ TA, lush gardens, hundreds of trees and plants, and a public observatory deck on the cantilever with 360-degree views of the Singapore skyline. 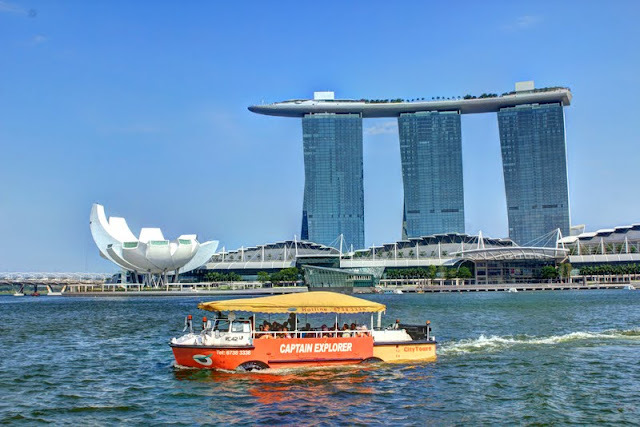 The Shoppes at Marina Bay Sands also boasts close to 1,000,000 square feet (93,000 m2) of retail space with over 300 stores and F&B outlets, including numerous luxury duplexes for boutiques such as Ralph Lauren, Chanel, Cartier and Prada. Other luxury stores include Gucci, Hermès, Emporio Armani, Chopard, REDValentino, Dior, Dunhill, Vertu, Miu Miu, Yves Saint Laurent, Salvatore Ferragamo, Montblanc, Blancpain, an Hermès Watch Boutique, and Herve Leger. A canal runs through the length of the Shoppes, in the same style as the Venetian in Las Vegas. Sampan rides on the canal are available for guests and shoppers at the shopping mall, similar to the gondola rides available in the Venetian. Also housed within the Shoppes are the five of the six Celebrity Chef Restaurants - Cut (by Wolfgang Puck), Waku Ghin (by Tetsuya Wakuda), Pizzeria and Osteria Mozza (by Mario Batali), Guy Savoy (by Guy Savoy), DB Bistro Moderne (by Daniel Boulud). Two notable attractions of the resort are the two Crystal Pavilions. - Avalon and Pangaea.The second Pavilion houses the world's largest Louis Vuitton boutique, in addition to being on a floating island, at 20,000 square feet (1,900 m2), which is connected to the portion of the boutique in the Shoppes via an underwater tunnel. The Sands Theatre and Grand Theatre seat 1,680 people and 2,155 people respectively, with The Lion King showing, and international acts, such as Cirque Éloize and A. R. Rahman's Jai Ho, located in the latter during their world tours. The Broadway smash musical, Wicked, is set to run for a limited season. Next to the theatres is a skating rink (synthetic ice) measuring 6,500 square feet (600 m2), rivaling that at the Rockefeller Center, New York. Moshe Safdie designed an Art Path within the resort, incorporating seven installations by five artists including Zheng Chongbin, Antony Gormley, and Sol LeWitt. The pieces are meant to play on environmental influences including light, water and wind, integrating art with architecture. Bugis Street houses about 800 shops, which makes Bugis Street the Largest Street Shopping Location in Singapore. You will find affordable items here, it range from Tshirt to work wear, sneakers, boots, posters calendar, Mobile Accessories, Bags & Accessories, and anything related to fashion. 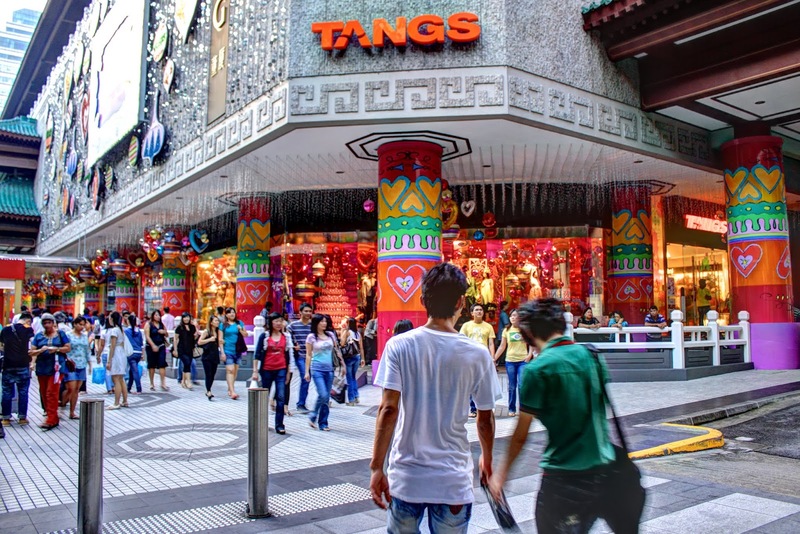 Bugis Street is located opposite Bugis Junction & conveniently features an MRT station (Bugis). 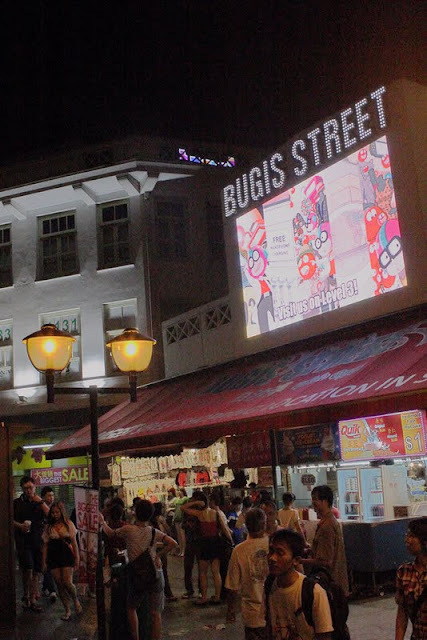 You can easily find it or you can browse The Bugis Street website to find a maps & direction to get there. 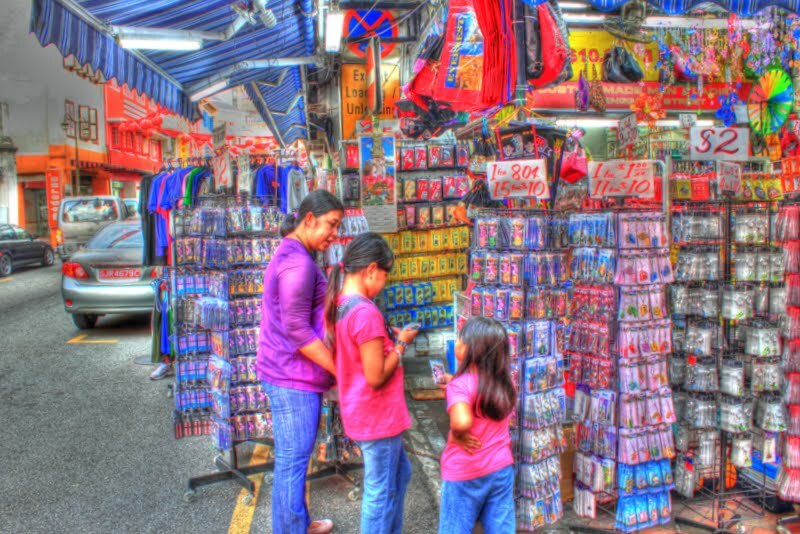 If you dont have time to buy Singapore Souvenirs, there are lots of them here from 10 for $10. Tired from shopping and get hungry, there are lots of snacks to munch on. The merchandises at Bugis street are more vary and more fashioned than at Chinatown. Try to compare the prices before you buy. if you have a lot of time.